Mary Jane is one tough cookie. But no plant species is indestructible. Marijuana certainly ranks amongst the hardiest of crops and grows on every continent; assuming the pyramids hidden in Antarctica have a few grow rooms. Unfortunately, whether you choose to cultivate cannabis indoors or outdoors with the greatest care and attention, things can still go wrong. That being said, you can take a number of preventative measures to increase your chances of a healthy, trouble-free crop. Indoor growers have far greater control over the environment. But even if you grow outdoors, two basic principles can and should be applied to every grow-op. First, the grow space should be clean and tidy. Second, it must be quarantined as much as possible. Good housekeeping goes a long way with weed. Poor hygiene in the growing area is an open invitation to pathogens. Sealing-off cannabis plants helps to avoid involuntarily introducing sickly invaders. Your cannabis plants can’t tell you what’s wrong with them. However, they will express symptoms. It’s the grower’s responsibility to accurately diagnose and apply treatment. This can only be accomplished if you know what to look for. Examine your unhealthy cannabis plants and carefully read the next section for a solution. 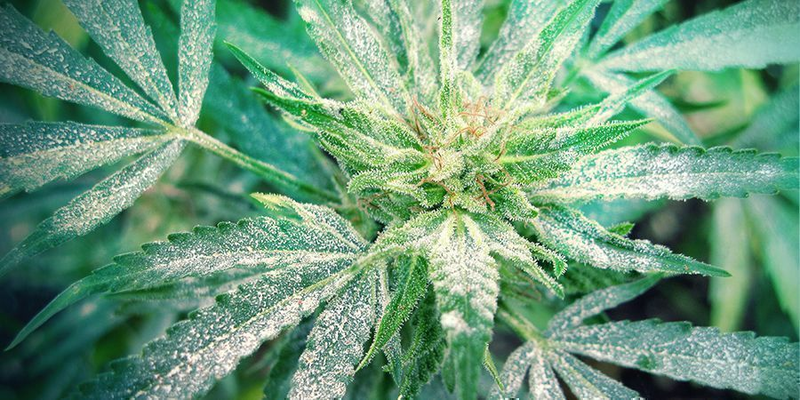 Recognizing Bud Rot, also known as Botrytis Cinerea or Grey Mould), is something every grower needs to learn. One way of catching the presence of bud rot in good time is to keep a close eye on the leaf that grows out of the bud. When this takes on a strange colouration (see photos below) and is effortlessly pulled free from the bud with a gentle tug, then you can be 99% certain that there’s rot inside that bud. The causes of bud rot include dead leaves falling with the arrival of autumn, spiders webs, the larvae and cocoons of insects... they all rot in your plant. The most usual cause and a very common fungal disease in cannabis is Pythium. This mould leads to root rot and rotting of the lowest section of the stems. It usually attacks young plants and clones. Bigger, healthier plants are much less susceptible to Pythium. In serious infestations of Pythiumm, the plant gets ‘toppling disease’. We don’t have to spell out what that means. Pythium can be recognized by the way the bark turns brown at the base of the stem. In the beginning, the brown scale can easily be removed, later the rotting process goes even deeper into the base of the plant. Pythium is a mould, which thrives best in wet and moist environments. The spores of Pythium are only spread via water. There are two types of spore formed: swarm spores and rest spores. The swarm spores germinate best at a temperature of around 15 degrees C., while the rest spores start growing in the warmth, so at about 28 degrees C.
To prevent infestation by Pythium, a constant soil temperature is desirable. 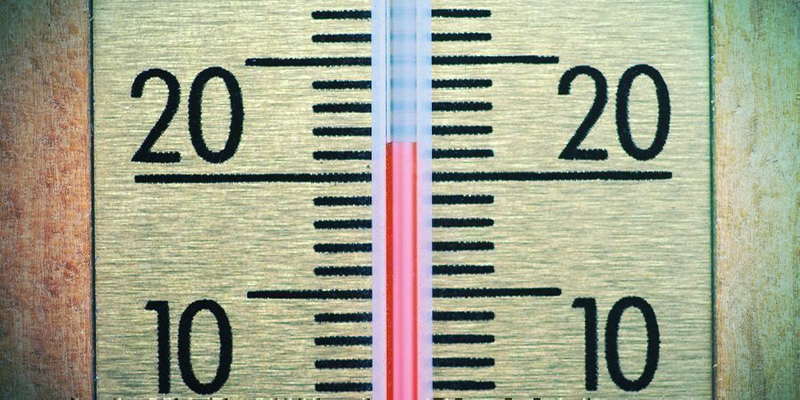 Large temperature fluctuations should be avoided. You also need a good level of humidity (so not too high an RV). Leaf moulds, mildew and filament fungi are less common than pythium. Mildew can cause bud rot among other symptoms. Other causes of bud rot include the leaves that fall in autumn, spiders’ webs, and the larvae and cocoons of insects. Prevention is difficult in a western European climate because this mould prefers low temperatures and high air moisture content – something that in this part of the world is pretty unavoidable. Try to keep the plants as dry as possible. It’s an idea, for example, to shake the morning dew off your plants each day, and to place them in direct sunlight and in a spot where the wind creates sufficient ventilation. The most optimal situation is to bring your plants indoors each night so that they avoid the worst cold and dampness. Placing the plants a little above the ground will also keep the soil temperature a bit more stable and means their resistance falls less dramatically, leaving them more able to fight off diseases. Another solution for next year is to darken the plants early so that they flower before the autumn raises its damp head. The buds will also be able to make use of the power of the sun during the summer months and will probably be a better quality as a result. It is also worth preventative spraying with Bayer’s Teldor during the growth period, twice (or 1 x Teldor and 1 x Finesse to avoid resistance), and again once the bloom begins. During flowering, only spray on the stems. Teldor binds with the waxy leaf layer and therefore does not easily wash off. The only thing you can do against it during flowering is to trim off the infected branches and sterilise your scissors in between each removal. You’re dealing with a fungus and fungi release spores that can very easily infect other parts of your plant. It’s worth trying to cover the infected leafage with a plastic bag before you cut it off, to reduce the spread of spores. Work precisely and very hygienically, and continuously check your plants for new infections. As soon as any bud rot occurs in your plant it is usually a lost battle, so in a real emergency the best thing is to just harvest your ladies good and early and by doing so hope to salvage some of the harvest. In the event that mould affects the stems and branches it can be kept reasonably under control by smearing the affected area with old-fashioned ‘green soap’, a well-known thick paste cleaner bought in a pot or bucket, applied with a small brush. The basic (alkaline) environment will stop the mould, the spot will turn black and deterioration will stop. Just don’t rub it into the buds! In cases of infection, it makes sure that the branch or stem remains a while longer and that spore release does not take place. Another option is to remove as much as possible of the affected areas and then scrub lightly with a 3-10% solution of hydrogen peroxide. The stems and trunks can also be smeared with a mix of Teldor, bleach and Dettol (don’t spill on the roots!). Harvesting and smoking bud rot? Smoking weed with bud rot or other moulds is not recommended! The best chance you have of salvaging anything is to use water curing (see note on the subject). Mildew is the general name for a certain set of mould infections that strike plants, in which various parts of the plant become covered with a white or grey fluffy mould. Real mildew (Erysiphe graminis) is common on various grains, with various specialised forms (forma specialis) adapted to each specific grain variety. Moulds tend to thrive best in damp conditions, especially if there is little circulating air. Under these conditions, mould spores that are always present in the air find a spot where they can establish a foothold and start growing into adult fungi. When you have not succeeded in preventing this mould growth, then you need to get on top of the situation as fast as possible. 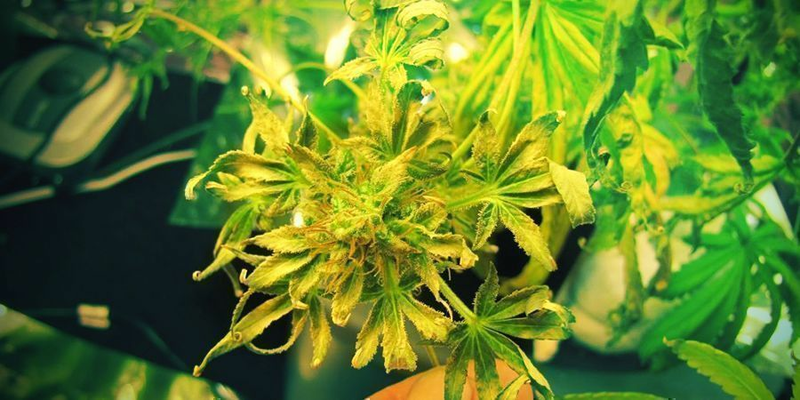 If the fungal growth is still moderate, immediately remove the infected parts and make sure that the growing environment of the cannabis is suited to the plant rather than the mould; that is, with good ventilation, control of the air humidity and temperature, and your plants not sitting in too wet a medium. If the infestation is more serious, there is no other option than to spray with poison (fungicide). Repeat the application after a few days, even if it looks as if the first application cleared up the trouble. Even then, it still applies that you need to control your climate better. The application of fungicide should be seen as a last resort. It is not healthy for young plants or people, so this is another case of prevention being way better than the cure. Leaf moulds (such as mildew) and filamentous fungi are less common than pythium. Mildew can cause among other things bud rot. Here too the same precautions can help: maintain an optimal control of your climate. Unlike many other moulds, mildew also does well when air moisture content is low. Bud rot usually strikes towards the end of the bloom phase. The more compact the plant, the bigger the chance that it will rear its ugly head. You can recognize bud rot by the way bud leaves suddenly turn yellow. These yellow leaves also come loose from the bud with the slightest tug. To prevent the whole plant from becoming infected, I’m afraid you’ll have to remove the whole bud. Bud rot can be prevented from striking to some extent by ensuring your grow space maintains a relatively low air moisture during its dark periods. It was only about three years ago that South American researchers came up with an alternative prevention of real mildew. Brazilian scientist Wagner Bettiol found that weekly spraying with milk could keep infection by real mildew as well under control as by spraying with synthetic pesticides. 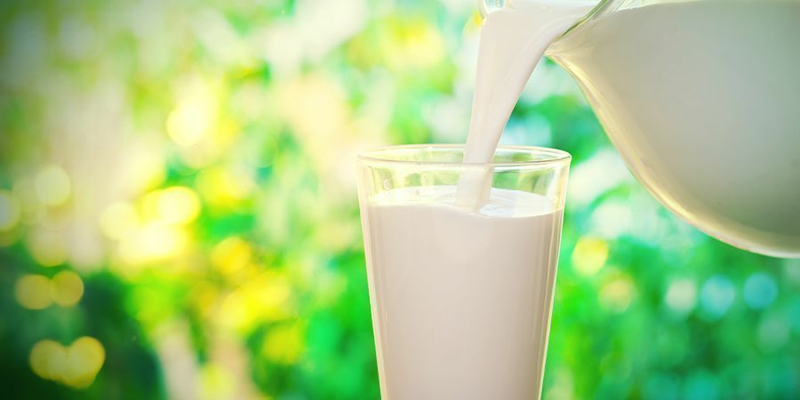 Not only was milk a good plant protector, it also turned out to be a useful nutritional supplement for the leaves, one that boosted the plant’s immune system. From the results of his experiments, it appeared that a weekly spray with a concentration of at least 10% (1 part milk to 9 parts water) reduced the extent of the mildew infestation by 90%. Just make sure you do not increase the concentration too much since above 30% it starts to serve as a nutrient base for infection of the leaves by another mould. TMV is a virus belonging to the Potyviridae family that consists of small rods approximately 700 nanometres long. In an infected plant, the youngest leaves develop ring-shaped yellow-green patches, circular shapes and meandering lines. The older leaves develop a yellow mosaic. The leaf turns fully yellow in a short space of time. Sometimes infection happens without the symptoms of the virus being visible. An attack by mosaic virus occurs mainly in summer and autumn when there are a lot of winged aphids around. Aphids can easily introduce the virus. When you’re working amongst your crops you can also inadvertently spread the virus to a lesser degree. Spreading by seed or in soil is not possible. The virus has many carriers, including lettuce and various weeds, and can survive in these plants. It also infects other commercial crops including tobacco, cucumber, tomatoes, and so on. Cross-infection is possible (hemp to tomato and vice versa). From the moment that the virus enters the plant, there is no way to get it back out again; clones from this plant are also now infected with the virus. Warning: tobacco mosaic virus (TMV) can also be carried in cigarettes and rolling tobacco/shag!! The effects on the plant are very diverse, and the plant will never recover its previous strength because thanks to the state of the leaves, photosynthesis will remain reduced. The plant will never be a great one, that’s one thing that’s for sure, and in general, it will always be underdeveloped. As said earlier there is no real solution since once it’s in the plant it cannot be got rid of. But the environmental factors are important; a plant in a constant environmental temperature of 21 degrees Celsius or higher will have less trouble from the virus, so keeping your temperature up at this level is essential. The first step is to make sure you start your grow with a clean space, so make sure it has as few bugs as possible and wash your hands before playing with your plants. If this virus gets in the mother plant, then there’s a 99% chance that you’ll get it in your grow space too. In principle, it is already possible to detect in a clone whether there is a viral infection in it. So inspect it carefully. If the plant has any strange features simply discard it and use another one. In order to slash the chances of an infection, you need to start with good clones or take the process of making them into your own hands. You can also choose to grow from seed, which reduces your chance of TMV infection to a minimum. The big question, of course, is what’s the cost to your yield? The answer is ‘considerably’. Because your plant has the virus it will make leafage and these will deliver less. If you keep the temperature at 21+ the damage is liveable with, but outdoor plants will have a lot more stress from the infection if you live in a country that tends to have outdoor temperatures below 21 degrees. WHAT IS YELLOW LEAF SPOT? 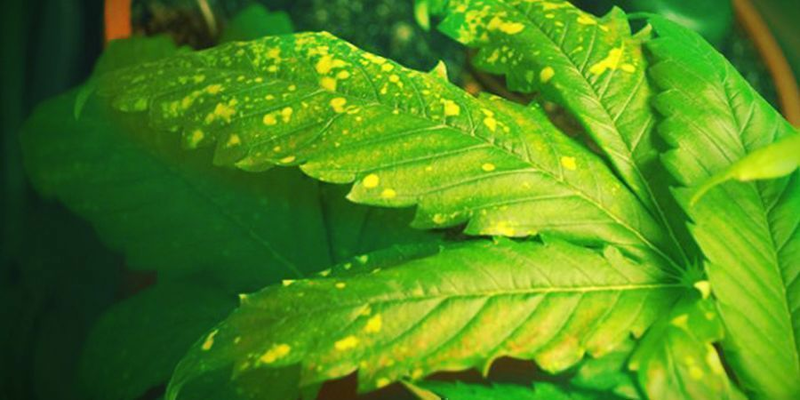 Yellow leaf spot or leaf septoria is a nasty fungal pathogen that causes lesions on cannabis plants leaves. This infection starts with the oldest leaves on the bottom of the plant. At first, yellow spots appear on leaves, then they scab over as spores proliferate. Leaves will turn brown, die, and drop off. If left untreated, it will spread up the leaves and is highly contagious to the rest of the plants in the garden. Damp, humid conditions where moisture accumulates on leaves is the perfect breeding ground for fungus. High levels of RH in the grow-op or heavy rainfall on outdoor crops are almost always associated with outbreaks. Poor airflow is also a big contributing factor. Regrettably, there really is no cure for leaf septoria. Affected areas must be surgically removed. Fungal spores can spread all too easily. You need to glove-up with a pair of latex gloves and prune with sterile scissors. Bag-up all removed leaves immediately as you cut away infected material. Take care to make sure nothing drops into the pots. Or if outdoors, onto the soil, as the fungus will spread there too. After trimming, take a shopping trip to the local grow store. The remaining healthy leaves and stems can be sprayed with a specialised copper-based fungicide. However, if you are dealing with this problem during bloom, spraying is not recommended. Indoor growers can avoid this pathogen by monitoring environmental conditions and keeping RH under control. A thermo-hygrometer can give you all the temperature and RH data you need at a glance. Adding a simple oscillating fan or clip-on fan in tighter spaces can greatly improve airflow and reduce leaf moisture. Overwatering and leaving pots sitting in runoff water are also to be avoided. Root rot is a disease that can strike the roots of cannabis plants and is difficult to detect until it’s too late. Droopy, stunted plants that look under or overwatered may really be suffering from root rot. 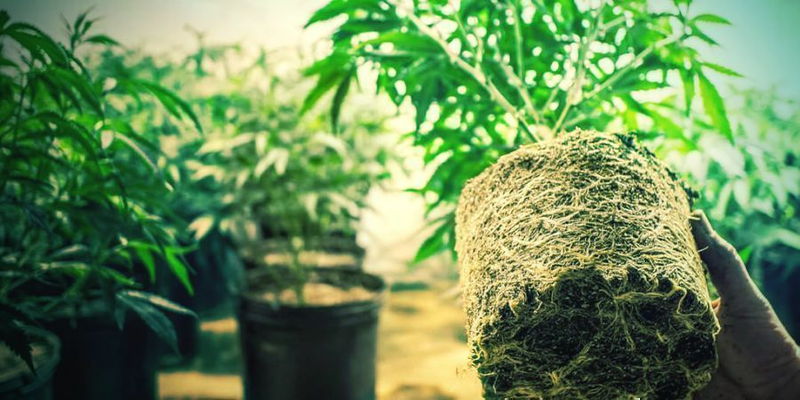 Hydro growers can take a look, with some systems, and see if roots are discoloured, brown, or clumped-up and coated in sludge. As for coco and soil growers, it’s most likely a foul rotten odour that will alert you. Too little oxygen and too much water in the root zone usually leads to root rot. Algae, bacteria, and fungus can all be responsible for causing the infection. 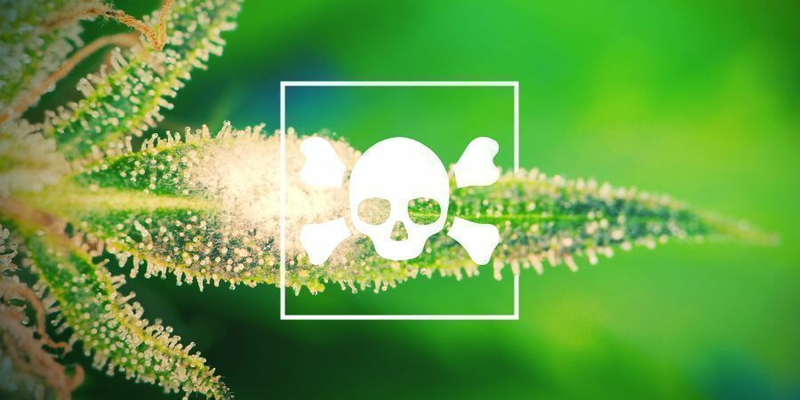 Unhealthy plants are more susceptible, although perfectly healthy plants can also be infected as many root rot-causing fungi can survive in the topsoil and in plant debris if the cannabis garden is untidy. Root rot can really be a crop killer. The only medicine is to return the grow-op or garden to a root-friendly environment ASAP. Sterilise and start again. Under no circumstances should you reuse the medium. Specialised products from the grow store may be worth a shot, but nothing can cure root rot with a proven high success rate. Hydro growers need to check water levels in the reservoir and make sure air pumps are bubbling to keep that water oxygenated. You may need to make a switch to chemical-based nutes if algae is an issue. Soil and coco growers need to provide plants with a well-aerated root zone too. Always use cannabis-specific mediums that drain well. Don’t be afraid to add more perlite to substrates to improve drainage. Make sure plants are not sitting in pools of runoff water and consider using Air-pots instead of conventional plastic containers. Of course, adding beneficial microbe supplements to water and substrates helps to create a stronger, more resilient root zone. 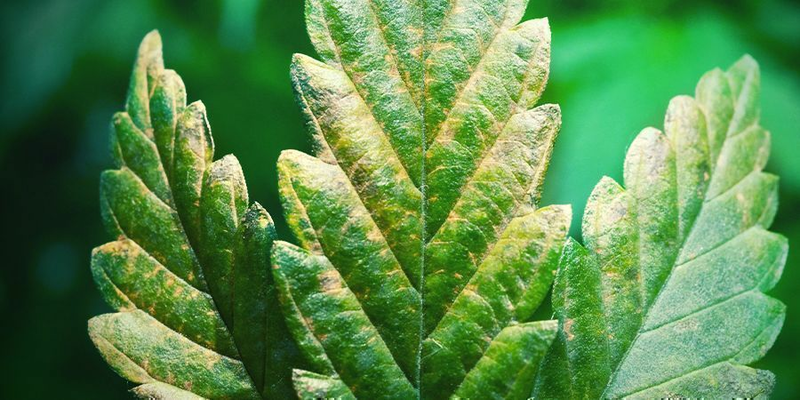 Blight is not one cannabis ailment; rather, it is a combination of common symptoms associated with a variety of fungal and bacterial infections. Think sickly, weak plants suffering from chlorosis and stunted, abnormal growth. High humidity, overwatering, and poor hygiene inevitably blight cannabis plants. Ultimately, grower error is often to blame. It’s the responsibility of the grower to maintain an efficient wet-dry cycle in the root zone and to keep the cannabis garden clean. The only cure is to correct the mistake you have made. Growers must monitor environmental conditions and plants’ behaviour continuously to identify problems. Many growers keep a grow diary to learn from each crop and keep track. Growers that develop a feeding schedule and a daily plant care routine are far less likely to encounter blight. The more you can control environmental conditions and nutrients, the better. Healthy cannabis plants cultivated in close to optimal climatic conditions will not succumb to blight.